A few years ago I bought an Elgato video encoder at Macworld. This little thumb device immediately became a regular part of my video encoding workflow. 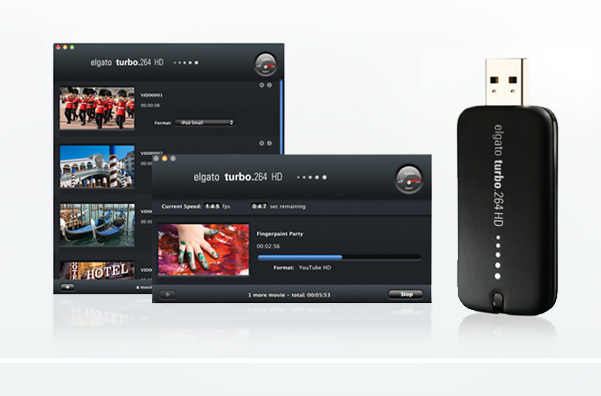 Recently Elgato released its upgraded HD version, the Turbo.264 HD which has improved upon the original in every way. The Turbo.264 HD uses a new HD encoder that handles more formats and is faster than its predecessor. How fast? Really fast. I’ve been using the device a month and usually encoding goes twice as fast with the Turbo.264 HD than it does without it. Sometimes quite a bit faster. The science behind the Elgato Turbo.264 HD is its ability to take the video encoding work from your processor and do it with the Elgato’s own hardware encoding accelerator. In addition to accomplishing this faster than your Mac’s processor can, this also gives the added benefit of freeing up your processor for other jobs. Elgato has also improved upon the software. The new version has easy to use presets but also allows you to tweak away.There is also a lightweight editor that allows you to trim and merge clips. The merge function is particularly useful for joining tracks. The QuickTime settings, not present on the older device, give you a ground zero way to export your video. 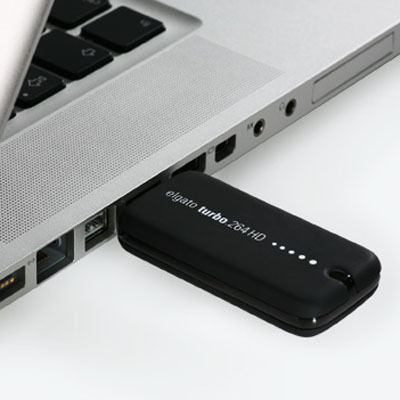 You can set up multiple projects at once and the Elgato will rip through them without further interruption. Import and export are also easier with baked in support for AVCHD camcorders which converts what used to be a very tedious process into lickety split drag and drop. You can also directly export and upload to YouTube from within the Elgato software. The device itself still looks like an oversized USB thumb drive. This time there is no cap for the USB plug but it does include a short USB extension cable that is handy when using it on a laptop with close set USB ports. At $150, this product is not a necessity but it is wonderful luxury. It is good at what it does, consumer level encoding acceleration. It is fast and the final product is good. I don’t see it getting used for any feature films but for the stuff I make, it is just fine. The tipping point is if you are having troubles with video encoding or the process of encoding is interrupting your work. If you encode video once a month and start it off before heading to bed, you can move along. If, however, you are all too familiar with a sluggish Mac and endless encoding of files, you owe it to yourself to take a look at this product. 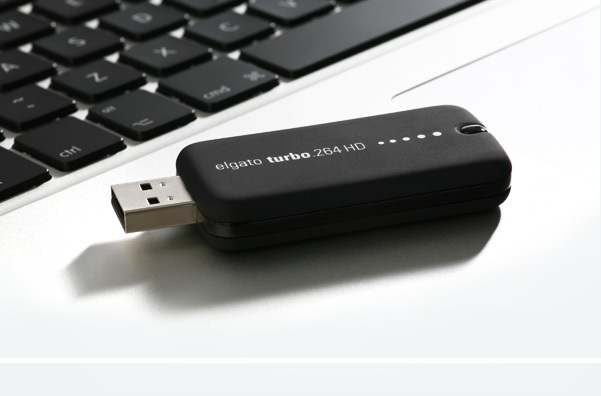 The Elgato Turbo.264 HD can pay for itself in saved time. You can listen to this review on Surfbits #213.